There are lots of file conversion software out there but none is more complete than Format Factory. 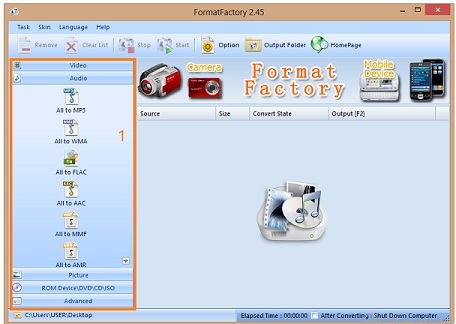 Format Factory is suitable for any kind of conversion be it conversion between different video, audio or even image formats, repair damaged video and audio file, reduce multimedia file sizes, support iphone, ipod multimedia file formats, picture converting supports Zoom,Rotate/Flip,tags, rips DVDs and Cds, supports 60 languages. I have used several file conversion software in the past and none is as good as Format Factory. 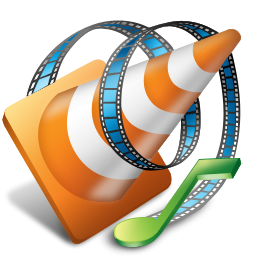 You can also create .ISO images; join multiple video files together into one with this freeware program. After downloading and installing the Format Factory file conversion software on your PC, launch the program from your Desktop. Step 1: Select the file you want to work with (Video, audio, images etc) as illustrated from the image below. 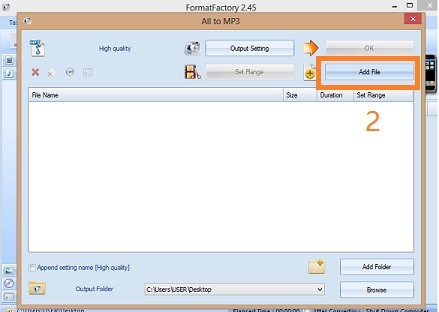 Let’s say you want to convert an audio file from another format to MP3 you will choose All to MP3, or WMA to convert to WMA format etc, Same with video and picture formats too. Step 2: Once you have selected the format you want to convert to, you will be prompted with another window. Add the file you want to convert by clicking on the “Add file” button to choose the file from your computer. You can also use the “Browse” button to change the output folder location. You can also edit the output settings from the “Output Setting” button and set Range for conversion etc and when you are done with this stage click the “OK” button. Step 3: Then click on the “Start” button to begin your conversion. On completion of the conversion, the program will indicate that the file has been converted with a little notification on your PC. Now you can open your Output folder to view the converted file. If you ever need to convert any file from one format to the other be it audio, video or even image files, rip DVDs or CDs, split or merge files in variety of formats, then I recommend Format Factory file conversion software. Download the Latest Version Format Factory for free. Check it out. If you have any questions or contributions, please use the comment form below. Remember to subscribe to my RSS feed. 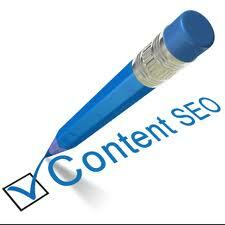 What an insightful info on this article, your blog is best! Your site is so much interesting.I read it carefully.There is a description how to use format factory & there are have some tips.I think this tips is useful to use format factory.You are welcome. Thanks for commenting, Format Factory is indeed an awesome file conversion software and its also a freeware. Glad you found it interesting, thanks for visiting and commenting. Wow, all in one conversion software ! I was searching this kind of software when one of my video file (marriage video) reached the maximum space then dvd’s space available ! It was my 15 hours work :) I tried some other software for conversion, but they failed to maintain the quality. I hope this software will help me ! Thank you for sharing ! Cutting down some of those massive file sizes is a must Nwosu. Great review here. By using the right conversion software you can save yourself time and energy. If the length is too much, you can split and convert and merge them later. Thanks for commenting, do have a nice week ahead. There may be file formats that are not supported by Format Factory, but in terms of versatility this tool is hard to beat. As long as we’re looking to convert popular file formats, this application stands as an accessible solution for doing that in a painless, straightforward process. Thanks Martin for your comment, Format Factory is really an awesome file conversion software everyone needs to have. This is one of the best conversion app for Windows. I have been using it for a few couple of days. 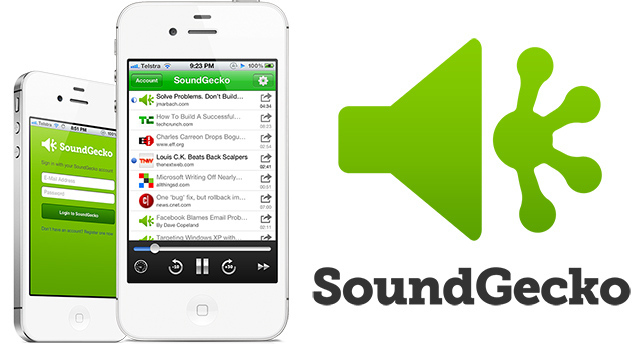 I also find this app very useful and i always use it to convert my multimedia files easily. Thanks for sharing this great software. i will be using this today onwards. Thank you for useful information for me. And I will try to study the benefits that I received it. I would say that your web site is very useful.